We are a family of two and so the quantity of meals prepared is very less. It often leads to a situation where only a couple of teaspoons of a particular dal is remaining. 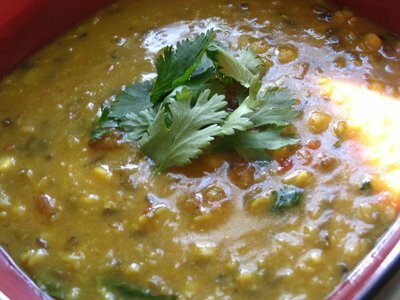 Panchmel dal is the perfect way to capitalize the situation and create a dish that will not only use up the remaining ingredients but also win loads of appreciation from family members. Soak all the 5 dal together in water for half an hour. Heat oil in a cooker and add zeera, hing and curry leaves. Add the rest of the ingredients and 2 ½ cups of water. Put the lid on with the whistle. Keep the cooker on high flame till one whistle. Then keep it on low for 10-12 minutes and take it off the gas.